A: Once you are logged into the affiliate program, please click the �Edit Your Account� link at the top of the page and you will be taken to a screen where you can modify your payout information, address, email address, or change your password. Please note that this only changes the information in our system, it does NOT change it at CCBill, due to their policies. You will need to contact their support department separately to change it there and CCBill will NOT allow us to do this for you. We apologize for this inconvenience but, it is out of our control. Am I paid on your exit traffic from your websites? A: Yes. Your affiliate id number tracks the user for as long as they are in our system. If they join one of our other sites you will be credited for the join. Can I make money by referring other people to CelebrityCash? A: Absolutely! We pay you 5% of sales brought in by the referred affiliate. A: Simply visit click on the �Forgot your Username / Password� directly under the CelebrityCash.com login form and our automated system will provide you with your password. A: Initially you will earn 50% of all revenue generated from each member that signs up for one of our websites using your linking code. This includes revenue from trial signups and rebills for life. How do I earn a higher payout? A: You will receive a check every week, provided you accrue at least $25 (or your specified minimum payout) in sales for the week. Your check will come directly from our payment processor, CCBill.com. The pay period ranges from Sunday to Saturday. What company name will be printed on my checks? A: Your checks will be sent directly from CCBill.com. What do I do if I haven't recieved an expected check? A: If you don�t receive a check that you expected to get, please wait at least 15 days and then send CCbill an email. A: All new accounts begin at $25 per signup for each member that signs up for one of our websites using our standard linking code with your ID. When URLs are used that turn off exit consoles, we pay $20 per join. This includes only revenue from initial signups (not rebills). A: Payouts above the standard $25/$20 plan are earned based on performance and profitability. If you feel you qualify for a higher payout, please contact us and we will discuss it with you. A: You will be paid every other Friday by our accounting department. Your checks will come from Internet Commerce Group, Inc. Example Pay Period: 3/19/2006 � 4/1/2006 and this period�s payment was sent on 4/14/2006. A: Internet Commerce Group, Inc. is the company that your checks will be sent from. This is our main company name. A: If you don�t receive a check that you expected to get, please wait at least 15 days and then send us an email. I'm new to this, is assistance available? A: You bet! We�ll be glad to assist you in a variety of ways. Whether it�s finding a simple piece of material, a special creative or a comprehensive site review, we�re here to help out. Just drop us a note with your questions or give us a call. A: No. We offer our affiliates a variety of marketing tools that can be used independently or on a specified website, including search engine friendly links, free hosted galleries, full and half page ads, and email ads. Where can I get my linking code to promote your sites? A: Simply click on Marketing Tools [or whatever the link is] and select the type of promotional material you would like. The system will walk you through the creation the proper linking codes for that particular item. Why should I use markers in my links? A: Why not?! Markers are excellent little tools that will help you determine which banners, pictures, links, etc. convert the best and really capitalize on all your traffic. How do I know if a certain celebrity is featured on your websites? A: Because our celebrities are subject to change at any time, just ask us if you aren�t sure! We promise we won�t bite! Can I promote other sponsors using your free content? A: No. Our license agreement with our content providers stipulates that our content can only be used while promoting our websites. You may promote other programs on different pages in your site, but not with content that you receive from us. I've used all the banners you offer, can you provide me with more? A: We�re hear to assist you. Depending on what you want there�s a good chance we can accommodate. Just drop us a note explaining what you need or give us a call. Can I use one account to promote your program on multiple sites? A: Yes. You can use one account for all promotions. In fact, our linking section will enable you to use marker tags in your links to help you determine which site or page your traffic and signups are coming from. Please refer to the stats tutorial for more information on how to use marker tags. Can I promote your sites in search engines? A: Yes. Many of our affiliates take advantage of our search engine friendly links and marker tags to successfully promote our sites in various search engines. Can I link directly to your join page? A: We do allow you to link directly to our join page, however, we do not recommend it. We have been promoting these sites for many years and have put together the best converting tours possible for you to use. Can I send your sites traffic through exits from my site? A: Absolutely! Many of our affiliates generate substantial revenue by exiting to our sites. Our sites have proven to convert very well on targeted exit traffic. We even provide affiliates with special creatives that will help you to maximize your exit strategy. Can I promote your sites in thumbnail galleries (TGP)? A: Yes. We provide our affiliates with a variety of pre-made TGP galleries to use to promote our websites. We will host the galleries, or you can download the .zip files and host them on your own server. In addition, we offer affiliates free content which can be used to build your own galleries. 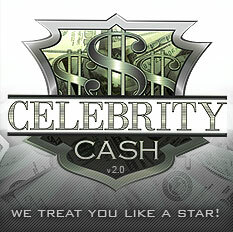 Copyright � 2014 Celebrity Cash (www.celebritycash.com) All rights reserved.